The destination that I love most is a quiet place in Wisconsin called Door County. We first started going there when I was a young child with my other siblings. When we were up there, it was always an amazing time. I always looked forward to heading up north every Labor Day weekend with my family. My Uncle Jeff and Aunt Diane also went on the trip, along with my cousin’s Anna and Matthew. For me and everyone else, I feel like some of the best memories were shared up there. My parents, my siblings and I began camping out in Peninsula State Park when I was in 1st grade. We would arrive in the park sometime in the evening and take to setting up our tent for the night. After that we would typically go and eat dinner with my aunt and uncle at one of the original spots such as The Summer Kitchen. Following that, we’d go back to the camp site and turn in for the night. In the morning, we’d get up and have a small breakfast at the campsite then we’d go and meet at a spot and head out on the bikes to ride all day. Riding through the park was always fun for me because all of us kids would race down the paths and try to be in the lead the whole time. This competition lasted from the start of the ride to the finish. The finish for the group was the park right beside the lake. We’d grab a table and have lunch underneath the trees. I can’t recall a time in the whole time we went there that the weather was anything but perfect. 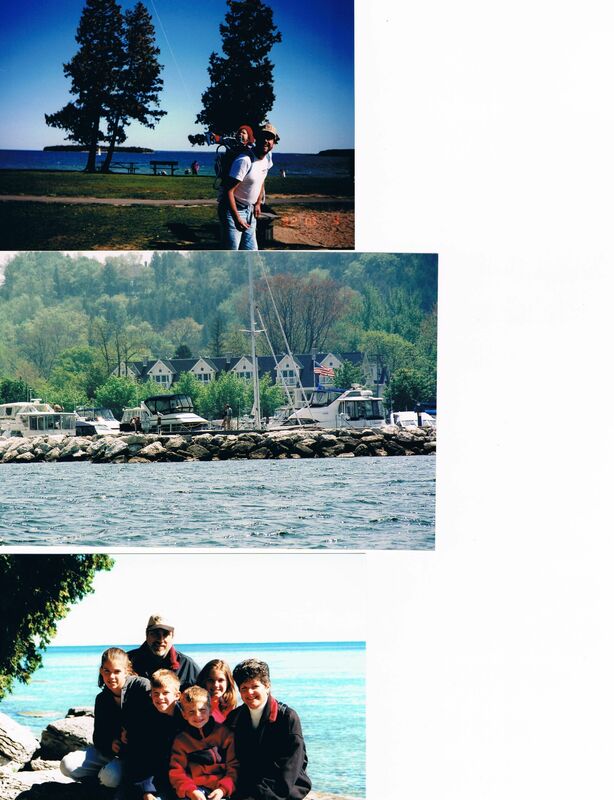 It seems as though every time we were in Door County, everything was perfect. From the weather, to the family atmosphere, it was like everything in the world was right for those couple of days. After our bike ride through the park, we’d ride out and stop at this ice cream shop called Not Licked Yet. I always enjoyed riding up to the ordering window because the driveway was very steep and it seemed like I was going really fast even though for only a short time. I myself am a big fan of ice cream so this was always a highlight of the trip for me. The other thing that made it great was that there was a playground for me and my cousins to run around on after we were finished with our dessert. We’d then go back to our campsite and my aunt and uncle would go back to the hotel they were staying in and we’d get ready for dinner that night. The places we went to varied every year. The thing that was for sure though was that everyone always came back to the campsite after and sat around the camp fire. Graham crackers, marshmallows, and chocolate made up the recipe for dessert. They’re called s’mores and they are unbelievably good. It always seemed as though the night ended to soon. My cousins would leave the site and it was off to bed for us. I’d crawl into my sleeping bag and slept perfect the whole night. That Sunday morning was always one that I had mixed feelings about. The reason it was great was because my mom made an awesome pancake and sausage breakfast on the camp stove. The drawback to Sunday morning was that we would have to begin packing up the tent and all our gear. There’s a little ice cream parlor that it was tradition to stop at on the way out. It was called Wilson’s. They had these miniature jukebox stations at each table and you could put on whatever song you wanted from the selection they had. I always thought that that was so cool. After all the ice cream was gone and it was time to go, I was begging for just a little longer. The drive out was never fun because it meant that I had to wait another year before I got to come back and experience it all over again. Every time we were getting closer to that time of the year, the anticipation for loading up the car and making the hall up north got to be unbearable. Given the chance, I’d go up anytime at the drop of a hat. That place to me holds some of the best memories I have. Family, good food, and fun are all components of why I love that place so much.